President Obama laid out his campaign strategy for the 2012 Presidential elections. President Obama in the well of the House of Representatives spoke in his full bully pulpit mode. "Pass this bill", "Pass this Plan right away!" Similar demands were used as rhetoric 17 times during the Jobsapalooza Campaign stop on Capitol Hill. Demands to "Pass this plan right away" were followed by threats from Obama reminiscent of socialist regimes, and speeches one would expect from behind the Iron Curtain the Politburo. Threatening to take the Jobsapalooza Plan nationwide, which he did on Friday, with a Jobsapalooza Campaign stop targeting Eric Cantor's Congressional District. Obama is trapped in Keynesian Wonderland and he continues in his pursuit of the failed economics polices of ivory towered professors and elites of the left. From an article at Forbes, "...And since Obama remains oblivious to how his Administration’s weak dollar policies and resulting high rates of taxation weigh on the economy like no other policy, his proposal from Thursday is doomed to fail. Sadly for all us, it will do more than fail. Not only will it not work, but for its stated objective being one of extracting even more capital from the private sector to destroy, Obama’s plan is quite simply harmful." Missing from the Jobsapalooza Not Jobs Plan is how to revitalize the manufacturing sector, or creating jobs and securing energy independence by drilling for oil and natural gas. The government now accounts for over 35% of the United States economy, and has replaced the manufacturing sector. The United States has lost 32% of all manufacturing jobs since October 2000. Political payoffs. Nearly one-quarter of this latest stimulus package — sorry, American Jobs Act — is aid to state and local government, to keep teachers and other public-employee union members on the job and paying dues to the unions. Altogether, unions gave Democrats some $400 million in the 2008 election cycle. Pretty good return on their “investment,” eh?" And Obama still wants his high speed bullet trains in his Jobsapalooza Not Jobs Bill, ..."Pathetic promises. Perhaps he hoped people wouldn’t notice, but Obama did put in two words — “faster trains” — as a plug for his pet project of high-speed rail. Liberal blogger Kevin Drum calls California’s HSR project, the largest in the nation, “a fantastic boondoggle,” likely to cost three or four times estimates and with ridership estimates that are “fantasies.” “We have way better uses for this dough,” Drum concludes. The Jobsapalooza Not Jobs Plan is however funded with over $400 billion in new taxes. "The White House objective is to put lawmakers in a difficult spot: Back Obama's jobs package or risk being portrayed as doing nothing to improve the U.S. unemployment crisis heading into the November 2012 elections. But the Democratic president's proposals to pay for his $447 billion jobs plan will be hard for Republicans to swallow. They said the idea of taxing the wealthy and corporations was not in keeping with a bipartisan path he was seeking. White House budget director Jack Lew said the biggest item in Obama's plan would raise $400 billion by limiting deductions and exemptions on individuals who earn more than $200,000 per year and families who earn more than $250,000. He also proposed raising $18 billion by treating the earnings of investment fund managers as ordinary income rather than taxing it at lower capital gains rates. He would eliminate many oil and gas industry tax breaks to raise $40 billion and change corporate jet depreciation rules to bring in another $3 billion. Obama stepped up his campaign to sell his proposals to American voters as he prepared to send the jobs bill to lawmakers later on Monday. "This is a bill that is based on ideas from both Democrats and Republicans, and this is a bill that Congress needs to pass -- no games, no politics, no delays," Obama said in an appearance in the White House Rose Garden, holding up a thick text of the legislation held together with a black clip. The president, who pushed through an $800 billion economic stimulus package in 2009, will see his re-election chances hinging heavily on his ability to reduce stubbornly high unemployment above 9 percent. The bottom line for Republicans was that Obama is now trying to pay for his jobs plan entirely with tax increases. "It would be fair to say this tax increase on job creators is the kind of proposal both parties have opposed in the past," said Brendan Buck, spokesman for House of Representatives Speaker John Boehner, the top Republican in Congress. "We remain eager to work together on ways to support job growth but this proposal doesn't appear to have been offered in that bipartisan spirit." 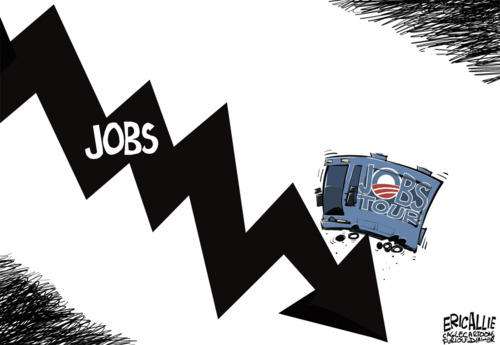 Here is an overview of the Jobsapalooza Not Jobs Plan from Obama: and it is not a pretty picture. The Jobsapalooza Not Jobs Plan is just a re-run of the misspent first stimulus bill, which did not stimulate the economy, and did not save or create any jobs. "...1. Temporary Tax Cuts. The president wants to extend and expand the temporary reduction in the Social Security payroll tax that Congress enacted last December. The president also called for a grab-bag of tax credits for businesses that buy new equipment, hire veterans or even give workers a raise. There is obviously nothing wrong with letting workers keep a bit more of their money. And some of the tax breaks might encourage businesses to speed up otherwise planned hiring or purchases, providing a short-term economic boost. But neither people nor businesses tend to make the sort of long-term plans needed to boost production, generate growth and create jobs on the basis of temporary tax changes. This is especially true when businesses can look down the road and see tax hikes in their future. 2. Further Extending Unemployment Benefits. The president wants to spend $49 billion to provide another extension of unemployment benefits to 99 weeks. Of course everyone can sympathize with the plight of the long-term unemployed. But, the overwhelming body of economic evidence suggests that extending unemployment benefits may actually increase unemployment and keep people out of work for longer. In fact, many economists believe that current extensions of unemployment benefits have already extended the average length of unemployment by three weeks or more. 3. Bailing Out the Teachers Unions. The president’s plan calls for spending $35 billion in grants to states to hire or retain some 280,000 teachers. The president wants to spend another $30 billion to repair and modernize school buildings, with the catch that school districts that accept the funds are prohibited from laying off any teachers. Spending on school building and repair has already increased by 150% over the last two decades, without either improving education or generating many jobs. And the greatest threat to teacher retention is not a lack of federal aid, but burdensome labor contracts. 4. More Infrastructure Spending. Like all the stimulus bills before it, the president’s latest proposal calls for still more pork barrel spending for “infrastructure.” One begins to wonder why we haven’t paved over the entire country by now. No doubt there are roads and bridges in need of repair, but the ability of the federal government to sort out good projects from bad is debatable at best. And the president is once again planning to plow money into such dubious projects as high-speed rail. 5. More Tax Hikes. Worst of all, the president plans to pay for all this new spending by -- you guessed it -- raising taxes on businesses and high-income Americans. The president, once again, referred to “millionaires and billionaires” in his speech, but his actual proposal calls for raising taxes on families earning as little as $250,000 per year. In places like New York, that’s not the “super rich.” In addition, many of these tax hikes would fall on small businesses. The president’s jobs plan, then, is to tax exactly those people and businesses that create jobs. And all this is on top of the new taxes and regulations that the Obama administration has already pushed through. It’s not just the details of the president’s proposal that are wrongheaded, it’s the basic concept. The real drags on our economy have nothing to do with the failure of government to spend enough. The federal government is now spending roughly 24% of GDP. State and local governments are spending another 10% to 15%, meaning government at all levels is spending roughly 40 cents out of every dollar produced in this country. If government spending brought about prosperity, we should be experiencing a golden age..."
Obama fully intends to increase the top marginal tax rates and he and his party have set a minefield for Republicans to cross in order to come up with a bill that Reid will not table and that Obama will sign, with many opportunites for Obama's strawman arguments. "...By inviting House Republicans to stumble into this trap, the president is also hoping to preempt the congressional super-committee’s option of reducing deficits by trimming tax loopholes. President Obama is trying to lay claim to any potential revenues from cutting loopholes (or legitimate deductions) for his own pet projects, which include grants to hire more state and local government workers and extended unemployment benefits for the private sector. This is no “jobs plan.” It’s a tax-and-spend plan, and a bad one..."
Here is a background article that links to a study by the Mercatus Center that explains some of the reasons the first stimulus bill failed. ..."The Keynesian theory was that a burst of new government spending would take up some of the slack in aggregate consumer demand. This was justified in 2008, again in 2009, and is still defended now based not on real-world observation but on abstract macroeconomic models that depend on the assumptions of the authors. The Congressional Budget Office's quarterly studies--often cited to claim the stimulus created tens of thousands of new jobs--are based on such a model. By informative contrast, Messrs. Jones and Rothschild interviewed actual people who received stimulus dollars and asked how they spent the money. In the first paper, the authors survey 85 different businesses, nonprofits and local governments across the country and conclude that "As is often the case when economic models are transferred from the blackboard to actual public policy, there was a gap between theory and practice." One of the major patterns Messrs. Jones and Rothschild uncovered was that the top-down stimulus was poorly targeted. In one redolent example, a federal contractor said he was told to use smaller, nonstandard tiles that are harder and more expensive to install in order to increase the cost of the project. That way, the government could claim the money was moving out the door faster. The famous Milton Friedman line about government ordering people to dig with spoons to employ more people comes to mind..."
Once again Thomas Sowell has nailed Obama, "...Obama says he wants "federal housing agencies" to "help more people refinance their mortgages." What does that amount to in practice, except having the taxpayers be forced to bail out people who bought homes they could not afford? No doubt that is good politics, but it is lousy economics. When people pay the price of their own mistakes, that is when there is the greatest pressure to correct those mistakes. But when taxpayers who had nothing to do with those mistakes are forced to pay the costs, that is when those and other mistakes can continue to flourish -- and to mess up the economy. Whatever his deficiencies in economics, Barack Obama is a master of politics -- including the great political game of "Heads I win and tails you lose." Any policy that shows any sign of achieving its goals will of course be trumpeted across the land as a success. But, in the far more frequent cases where the policy fails or turns out to be counterproductive, the political response is: "Things would have been even worse without this policy." It's heads I win and tails you lose. Thus, when unemployment went up after the massive spending that was supposed to bring it down, we were told that unemployment would have been far worse if it had not been for that spending. Are we really supposed to fall for ploys like this? The answer is clearly "yes," as far as Obama and his allies in the media are concerned. Our intelligence was insulted even further in President Obama's speech to Congress, when he set up this straw man as what his critics believe -- that "the only thing we can do to restore prosperity is just dismantle government, refund everybody's money, and let everyone write their own rules, and tell everyone they're on their own." Have you heard anybody in any part of the political spectrum advocate that? If not, then why was the President of the United States saying such things, unless he thought we were fools enough to buy it -- and that the media would never call him on it?" My favorite article I found for the President Obama's Jobsapalooza Not Jobs Bill can be found here : Arrogance is no substitute for experience. That is why the country is in the mess it is in now. Tonight we meet at an urgent time. The economic crisis you hired me to fix has gotten even worse. As unemployment rises and my poll numbers sink it's harder to blame George Bush. Reporters keep asking, "What will this speech mean for the President?" TV viewers ask, "Will this windbag shut up before the game starts?" Many people in this country work hard to meet their responsibilities. The rest are happy to take handouts from me. The question tonight is, can we stop the political circus long enough for Congress to spend another half trillion dollars so I can buy the votes I need to get re-elected? And if not, can I leverage this speech to blame my opponents? So I am sending Congress a plan that you should pass right away. Call, email, fax, and tweet right now, operators are standing by! I call it the American Jobs Act, although around the West Wing the interns are drawing little Charlie Brown placekick cartoons captioned This Time For Sure." The Jobsapalooza Not Jobs Plan is just more snake oil that will not cure this nations unemployment epidemic any more than some of the concoctions cured sick and ailing that were sold from the backs of wagons in the Wild Wild West, and often the cure could be more poisonous than the symptoms. The only job Obama is interested in is his own. Anyone who buys this new tired version of Obama's Jobsapalooza Not Jobs Plan are certain prey, and they are truly the definition of the old idiom, "A fool and money are soon parted." Loved the art.. I'm afraid his jobs plan, like anything Obama, is rooted in too much time smoking something, when he was a community organizer. Or as were finding out, a little too much Chicago Style Payback..